English Bulldogs are one of the most recognizable of all the breeds. They have a long and storied history and, with the right family, adjust very well. They are not for everyone, but if you are willing to put in a little time and attention, they are a loyal breed. The English Bulldog was recognized as a breed by the American Kennel Club back in 1886 and according to their records, the English Bulldog is one of the most popular breeds in the country, are related to the mastiff and are classified in the non-sporting group. The English Bulldog appears to be wider than he is tall with small ears, short legs and large eyes. The coat can be a solid color or a combination of red, fawn, brindle, pale yellow, washed-out red, or white. These are the only colors recognized by the AKC. Male and female bulldogs range from about 12 to 16 inches in height. Males weigh between 53 and 55 pounds and females between 49 and 51 pounds. The average life span is about 8 years. English Bulldogs were originally bred to fight bulls in competition. After the practice became illegal, bulldogs became pets, although it took a few generations to breed out the aggressiveness. Just don't expect them to go for a long run in the park. 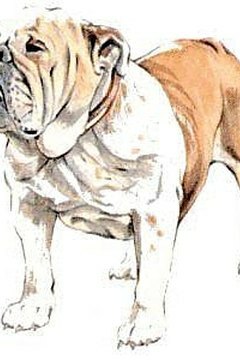 An English Bulldog needs an owner with a strong personality because Bulldogs like to be the Alpha animal. They are very much a pack animal, getting along with animals in the house, but not outside animals. Take the following health concerns into consideration. Bulldogs have breathing problems, poor eyesight, are susceptible to heat stroke, and get skin infections easily. Wash their face daily, especially under wrinkles. English Bulldogs have the potential to be the perfect apartment dog. They only need to be taken for a couple of short walks each day and are easy to groom because they have a short coat.